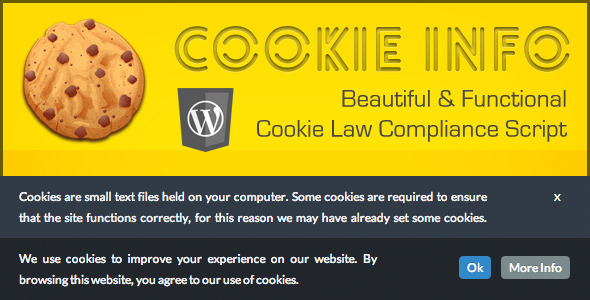 Cookie Compliance is an EU law. Inform your visitors in an elegant manner. Responsive Design: Works perfectly on smaller screens. The responsive design scales down to match the screen. Try resizing your browser! Easy to Customise: Dark or light theme, top or bottom, colours, text, buttons and many more easily configurable options. Lightweight: Only runs where necessary. Otherwise, just sits tight in the background. Weighs only 3kb and uses the latest technology and methods for efficiency. Easy Install: Simply activate the plugin and you�re done!